We have been experiencing some significant growth in our numbers. We have 55 Children in our care. This has led to a strain in several key areas. Food preparation and storage, as well as accommodation and water and waste management. This post will show you possible solutions and our way forward. We’ve been renovating our 5 existing homes as they have become run down. Plumbing issues, paint needed etc. This has cost us between 1,500 to 2000 for each home. We really need to recoup these costs, as they have come out of our financial buffer. If you can sponsor a children’s home renovation, please consider sending a donation today! Much needed renovations under way! We prepare all of the meals for each and every child and staff member in the small galley style kitchen in house 3. The kitchens were never meant to prepare this many meals. As we have grown, our procedures have changed. That’s how we ended up where we are in our food prep. Our dedicated kitchen staff are doing there best. But it’s difficult for them. And it’s not a good set up. We have drawings and plans for a separate kitchen facility. A stand alone food storage and preparation facility. It’s very important we proceeed with this project ASAP. The budget for this is approximately $30,000. 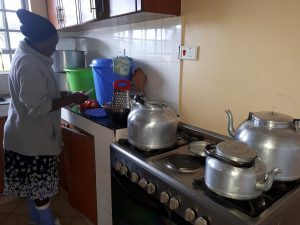 Lillian our full time cook and her assistant of the day hard at work in the overcrowded kitchen! We end up cooking certain things out on the veranda as there just isn’t space. 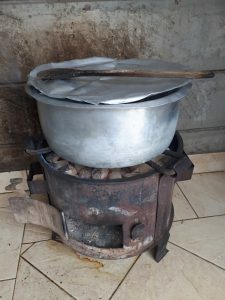 This outdoor cooker is known locally as a “jiko”. It uses charcoal for fuel. It requires constant supervision, as its very hot and there are children near by! Another reason we need a stand alone kitchen facility. You can see, not only is the counter space crowded, there arent enough burners on the stove! We need another stove, and a bigger one! 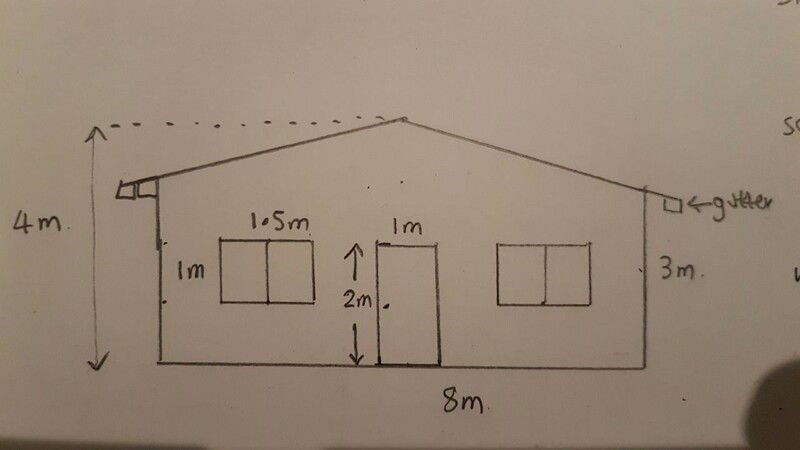 The outside measurements for the new kitchen. 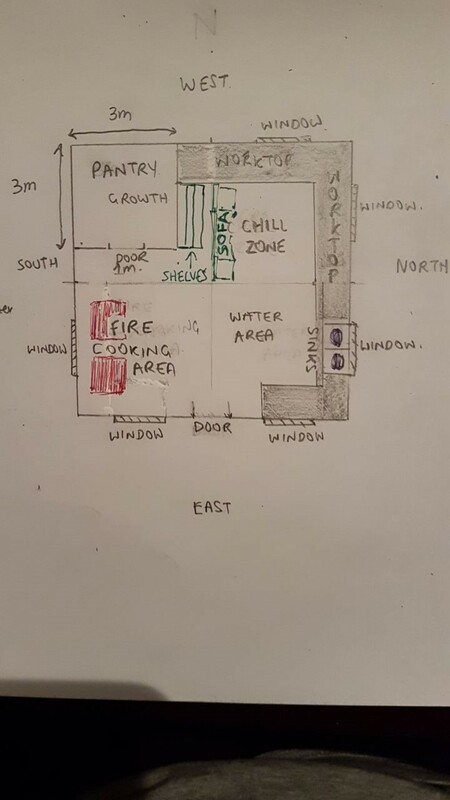 This rough but detailed drawing is how the new kitchen will look. 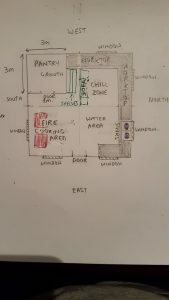 This is the plan and builder we are using. We hope to break ground ASAP! We have had a generous donation come in that will cover 2/3 of the cost. We need another $10,000.00 before we can break ground. 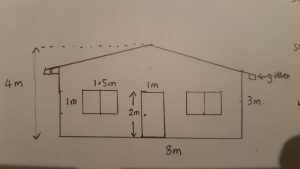 If you think you can help with this project, please send me an email or make a donation through PayPal or Canada helps through the links at the bottom of this page. 3. Time to Build New Homes! Exciting Growth. Finally, we really need to start considering new homes. When we began this ambitious project, our plan was to build 12 homes on our 16 acre property. So far we have built 4 and renovated an existing smaller building to become a temporary overflow home. The needs for the kind of care Mission:180 provides is overwhelming. We need to expand our facilities so we can save more lives. It’s that simple. We have been collecting quotes and considering builders for this project. We now know that each new home will cost us in the neighborhood of $65,000-$70,000 Canadian dollars. feel free to click the link below to see one quote and drawing. Its one option we are considering. Can you help? 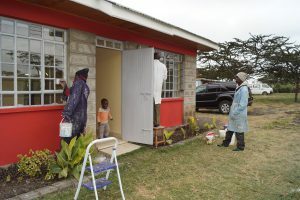 Every dollar you donate to our building projects helps us make a bigger impact in Kenya. More lives saved. More staff hired which means more pouring into the local economy and more families brought back from the brink of absolute poverty. Mission:180’s IMPACT is primarily in the lives of each child rescued. But of course, as we grow our needs grow. More staff are hired. And this translates into many many more lives impacted than we ever actually see! Your generosity is what makes this possible. Thank you for your giving! Thank you for considering a contribution to these projects. 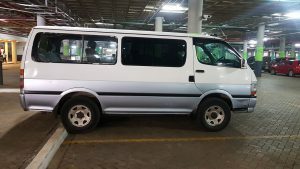 Through some recent contributions, we were able to purchase a “new to us” van from some fellow missionaries who were heading back to the USA permanently. We were in need of a second vehicle due to all of our growth. 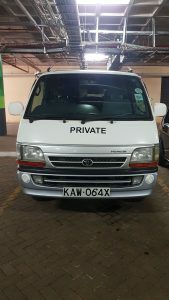 This Toyota Hiace 4 wheel drive is a perfect addition. Toyota Quality! We surely needed this addition! It is important to have the word “Private”, on the front. Otherwise you get waved over by the police too much. The van is the same as most of the local public service vehicles. The police routinely pull them over to collect “road tax”. All of these projects are markers of exciting growth and real IMPACT in the lives of Kenyans. 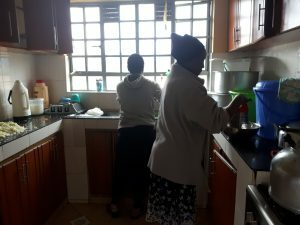 The most vulnerable and needy Kenyans! We are where we are today because of donors like you! And we say again to all of you who sponsor a child, or two or three, and all of you who give regularly to our general budget, who give generously to our special projects and emergency requests that pop up here and there, THANK YOU!!!!! We are so grateful for your assistance! As we look to the future, and we plan and prepare for growth, would you consider how you can help us accomplish the above projects? We need help! Please email jason@mission180.ca, and let me know. Or, use one of the methods on the bottom of this page or on the home page of this site, and make a contribution. It’s been Waaaay to long since we updated!